For other towns with the same name, see Grantham (disambiguation). Grantham is a town in Sullivan County, New Hampshire, United States. The population was 2,985 at the 2010 census, up from 2,167 at the 2000 census, the greatest increase in population in Sullivan County over this time period. Incorporated in 1761, Grantham takes its name from Thomas Robinson, 1st Baron Grantham, Secretary of State for the Southern Department from March 1754 to October 1755. Prior to county division in 1827, Grantham was in Cheshire County. The families of Howe, Dunbar and Leavitt were all early Grantham settlers. All three families secured lands in Grantham as part of the charter granted to Baron Grantham in 1761, and all three families "have Grantham hills named after them," according to Elmer M. Hunt in New Hampshire Town Names And Whence They Came. "The Leavitts are said to have had at one time fifty children in attendance at the town's school, and over the years no fewer than seventeen teachers." 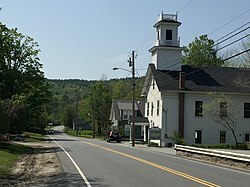 According to the United States Census Bureau, the town has a total area of 28.1 square miles (72.8 km2), of which 27.2 square miles (70.4 km2) is land and 0.9 square miles (2.3 km2) is water, comprising 3.15% of the town. The highest point in town is Grantham Mountain, 2,660 feet (810 m) above sea level, a peak along the ridge of Croydon Mountain, which follows the western edge of the town. Grantham lies fully within the Connecticut River watershed. A major body of water in Grantham is Eastman Pond which serves as a recreational hub of the Eastman Community. In addition Grantham boasts Anderson and Butternut ponds. The town is home to the Grantham Village School (opened 1981) and Dunbar Free Library (opened 1903). As of the census of 2000, there were 2,167 people, 924 households, and 707 families residing in the town. The population density was 80.9 people per square mile (31.2/km²). There were 1,513 housing units at an average density of 56.5 per square mile (21.8/km²). The racial makeup of the town was 98.29% White, 0.28% African American, 0.09% Native American, 0.42% Asian, 0.09% from other races, and 0.83% from two or more races. Hispanic or Latino of any race were 0.55% of the population. There were 924 households out of which 24.1% had children under the age of 18 living with them, 70.2% were married couples living together, 4.7% had a female householder with no husband present, and 23.4% were non-families. 19.2% of all households were made up of individuals and 7.1% had someone living alone who was 65 years of age or older. The average household size was 2.35 and the average family size was 2.67. In the town, the population was spread out with 19.9% under the age of 18, 2.9% from 18 to 24, 25.7% from 25 to 44, 29.7% from 45 to 64, and 21.7% who were 65 years of age or older. The median age was 46 years. For every 100 females, there were 96.1 males. For every 100 females age 18 and over, there were 95.6 males. The median income for a household in the town was $63,239, and the median income for a family was $69,271. Males had a median income of $43,250 versus $34,773 for females. The per capita income for the town was $32,174. About 1.4% of families and 2.5% of the population were below the poverty line, including 1.8% of those under age 18 and 3.8% of those age 65 or over. ^ "American FactFinder". United States Census Bureau. Retrieved 2014-11-04. ^ "Population Estimates". United States Census Bureau. Archived from the original on 2014-05-22. Retrieved 2014-11-04. ^ Hunt, Elmer Munson (1970). New Hampshire Town Names And Whence They Came, p. 15. Peterborough, New Hampshire: Noone House. ISBN 0-87233-009-5. ^ "Geographic Identifiers: 2010 Demographic Profile Data (G001) - Grantham town, New Hampshire". U.S. Census Bureau American Factfinder. Archived from the original on September 11, 2013. Retrieved November 15, 2011. ^ United States Census Bureau. "Census of Population and Housing". Archived from the original on May 12, 2015. Retrieved November 4, 2014. This page was last edited on 15 November 2018, at 18:25 (UTC).